History of Lightning Ridge The town of Lightning Ridge had its beginnings in the first years of the twentieth century, growing up around newly discovered opal fields. White settlers may have seen opal as early as the 1880’s, but mining didn’t begin until 1901 or 1902. The first opal rush occurred in 1905 on the long ridge near Wallangulla Tank, so the first settlement was called Wallangulla (Although the name ‘Lightning Ridge’ was in use in the late 19th Century – after a lightning strike killed a shepherd, his dog and sheep on a ridge in the 1870s – the name wasn’t officially adopted until 1963). By 1908 a second settlement, Nettleton Flat, had developed three miles to the west of Wallangulla and until World War 1, there were two communities of at least 2000 people mostly men. The Imperial Hotel later known as the Diggers Rest was built in 1909. Lightning Ridge suffered a decline after WWI, although the ‘New Town’ continued to develop through the 1920’s. During the depression, a government scheme paid miners a shilling a foot to sink shafts. The 1940s and 50s were fairly quiet, but when a syndicate of graziers sank an artesian bore in the 1960’s and miners began to wash their opal dirt, productivity increased and the population began to grow again. 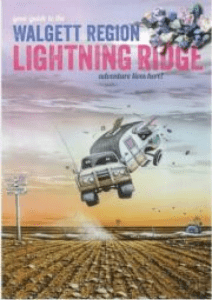 Lightning Ridge achieved town status in 1980. The Coocoran rush in the 1980s led to a huge boom – since died down – but the town is now a well-established regional centre with a culturally-diverse population of around 6000. Tourism is a growing industry and opal remains at the heart of Lightning Ridge.